The monarch overwintering population along the California coast is at an all time low, so what can we do in the Southwest? Don&apos;t panic, act! While monarch numbers along the coastal overwintering sites have crashed, there are still monarch adults and larvae in the Southwest deserts on native milkweeds, especially in the Coachella Valley in California, as well as in Arizona in the greater Phoenix and Tucson areas and Lake Havasu. Remember, small numbers of monarchs also return from Mexico through Arizona and New Mexico as well. 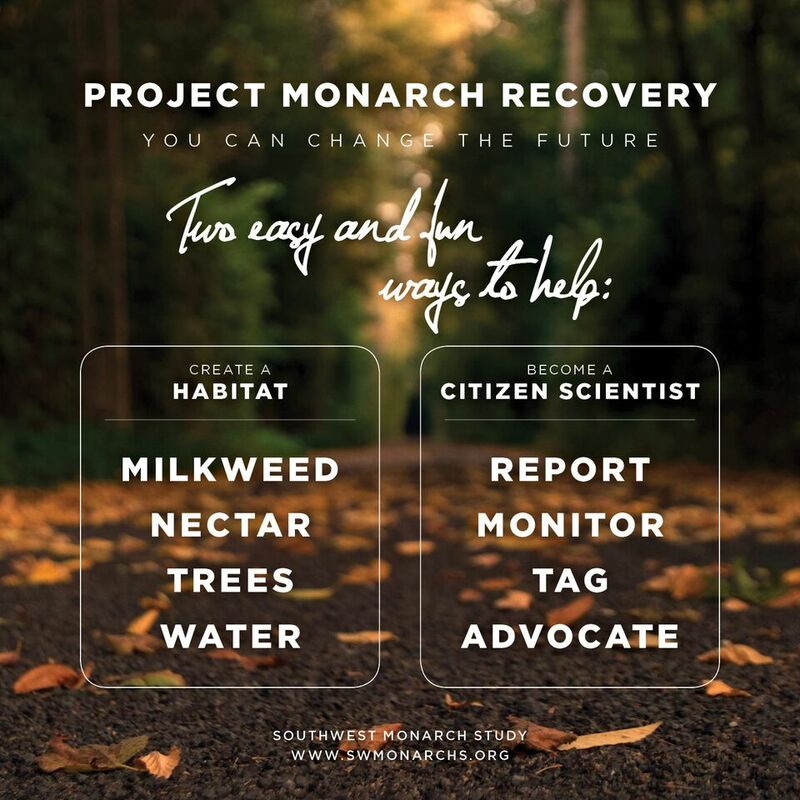 The best way we can gain a greater understanding and help monarchs in our region is a two-fold effort: Plant suitable habitat so monarch numbers can expand and focus on Citizen Science monarch research to fill in the data gaps of understanding. We&apos;ve created this Shout for Action list to jump start everyone to step in and make a difference. First, remember: More Milkweed, More Monarchs! The key is creating habitat: Plant NATIVE milkweed, spring and fall monarch favored nectar, with trees or tall shrubs to the west for protection from our blazing summer afternoon sun. Water helps! 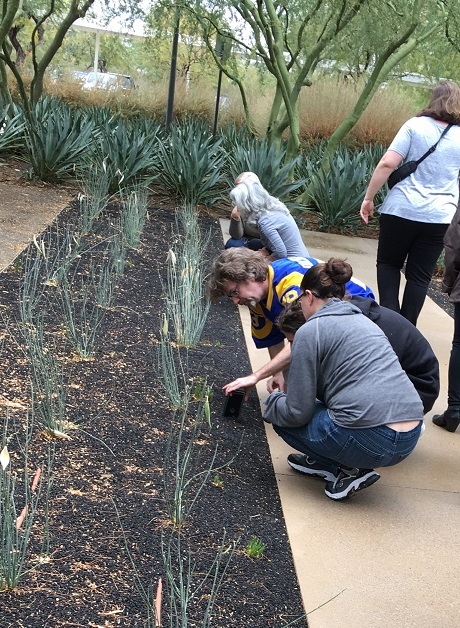 A moisture source nearby is beneficial in hot, dry locations whether it is irrigation in a home backyard or an ephemeral stream, riparian area, or a river in a park or on public lands. Check out our Monarch Waystation link for suggestions. Second, let&apos;s get back to science! We need more Citizen Scientists to participate in monarch research that is easy to do. Report every monarch you see, whether it is an adult monarch, egg, larva or pupa to Journey North and the Southwest Monarch Study so we can track monarchs as they move this spring. EVERY SIGHTING IS IMPORTANT! Can you spare a morning once a week? Commit to donating your time to monitoring a monarch habitat in your yard, park or public area once a week and reporting your findings. (Some of these locations may require Citizen Scientists to tag during the summer breeding season.) For more information about monitoring, see our Monitoring Monarchs page. Commit to tag this fall! See the time of peak migration for your area and mark your calendar to begin tagging a full month earlier. If you tag you can also easily participate in Monarch Health and test a sample of monarchs for O.e., too. Advocate for reduced use of neonicotinoids in growing milkweed and near breeding areas. Contact nearby plant nurseries and growers in your area to share your concern about the effect of neonicotinoids and other pesticides on pollinators and monarchs. When the eastern range of the monarch overwintering population in Mexico crashed several years ago, we received many requests for referrals to purchase farmed monarch eggs, larvae and pupae. Instead we urged everyone to grow milkweed and increase monarch habitat. Please take a few moments and read this important link. 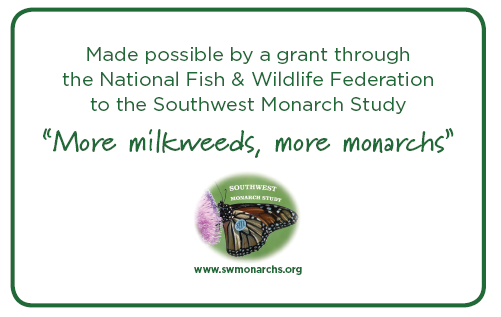 Help us learn more about wild monarchs in the Southwest! A NEW Journey North feature! Southwest Monarch Study Coordinator Gail Morris will be writing updates about the western population on Journey North based on your reports beginning in February. Promote more extensive tagging efforts of wild monarchs in the southwest especially in locations with data gaps. Using our National Fish and Wildlife Foundation grant we hope to work with Arizona Game & Fish, U. S. Bureau of Reclamation, Tonto National Forest, Coconino Nation Forest and more to add over 5,000 milkweeds to public lands in Arizona. Implement a new Citizen Science research project determining the effects of fall temperatures on breeding status in September and October in the Southwest. Initiate a new Citizen Science research project to monitor overwintering monarchs in the desert regions of the Southwest to determine breeding/non-breeding status, temperature and habitat conditions. Work with state Department of Transportation regarding roadside mowing and herbicide application timing. Advocate for reduced use of neonicotinoids in growing milkweed and near breeding areas. Publish recent research data regarding migration destination and breeding in the Southwest.